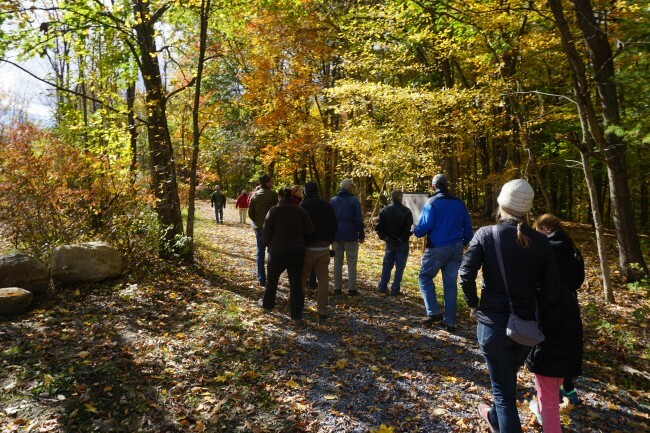 The Saratoga Siege Trail is a flat, half-mile walking trail, which follows along the south side of Fish Creek, and connects Route 4 and Evans Street. In addition to being a pleasant woods walk, the trail also possesses great historical significance. In fact, the area surrounding the Saratoga Siege Trail marks the location of a strategic American victory against the British Army during the Revolutionary War. In the fall of 1777, American soldiers pursued British forces north and across Fish Creek, following a decisive victory at the Battles of Saratoga. It was here that the Continental soldiers surrounded the British, destroyed their provisions, outnumbered them three to one, and left them no option for escape. Trapped by superior American forces, British general John Burgoyne surrendered his entire army on October 17, 1777. This battle is often attributed as being particularly influential in the acquisition of foreign aid, swaying the French to enter the war. This preserve is open to the public for nature study, walking, snowshoeing, and cross-country skiing. Please carry out all your trash and leave only footprints. Dogs must be leashed and under control at all times; please clean up after your pet. Please follow the rules so that this resource can continue to be accessible to the community. From Saratoga Springs, head east on Route 29 for 11.4 miles into the village of Schuylerville. Take a right on Route 4 and continue for 0.6 miles. Parking is available at the Schuyler House. Trail entrance is across the street from the Schuyler House on Route 4. Support for the creation of this trail came in many forms from the Alfred Z. Solomon Charitable Trust, the American Battlefield Protection Program, the Bender Family Foundation, Brookfield Power, the Community Foundation for the Greater Capital Region, Greenman-Pederson, Inc., NYSOPRHP, Saratoga National Historical Park, Siena College, Saratoga County, the Town of Saratoga, the Village of Victory, and the RBC Foundation. This trail is maintained by the Town of Saratoga Highway Department.